Cheung Chau, the island in Hong Kong where I live, is a major snack food destination for urban Hongkongers. Day trippers come to take selfies with skewers of deep-fried fishballs, slurp on lurid ice granitas and brave the cheesy baked oysters that are hawked from stalls along the seafront. 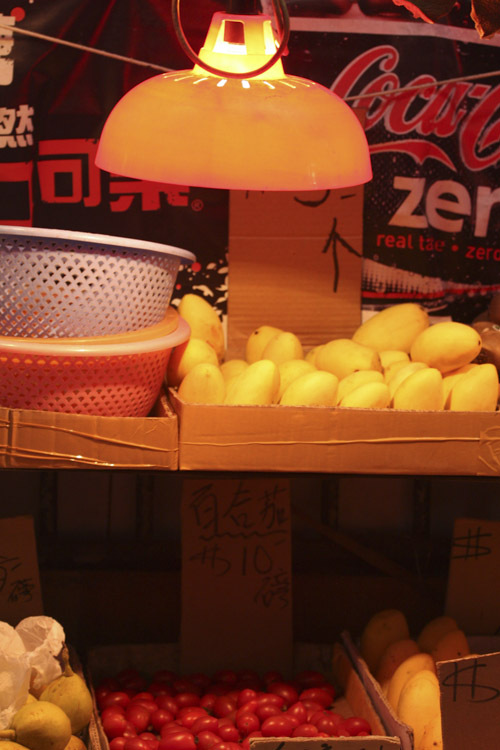 A year or two ago somebody decided to add mango mochi (sticky rice dumplings filled with a chunk of fresh mango) to the growing list of ‘traditional’ snacks on offer, and the flour-dusted sweets are now sold across the island. So! While Part 2 needs a bit more work, I proudly present Part 1: Mango Dream Ice Cream. 1. Mix the cornflour/arrowroot with 1 tbsp coconut cream and set aside. 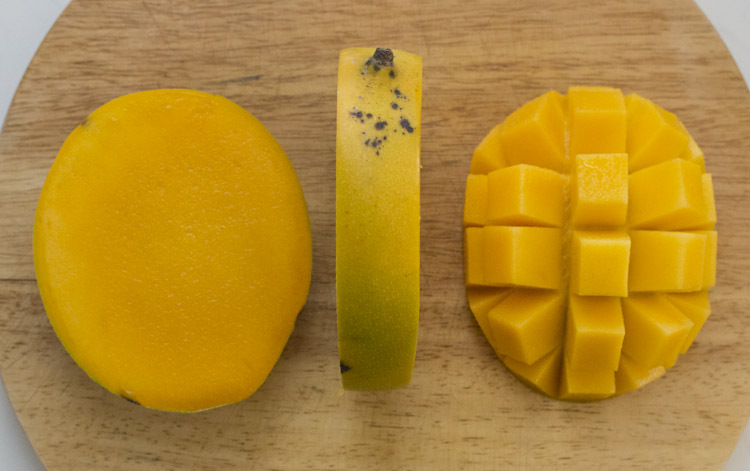 Then set about dissecting your mango – slice off the cheeks and either score the flesh in each cheek with a knife and scoop the cubes into a blender jug, or just set about it with a spoon. Use the spoon to scoop any remaining flesh from around the stone into the jug. Blend to a smooth pulp. 2. 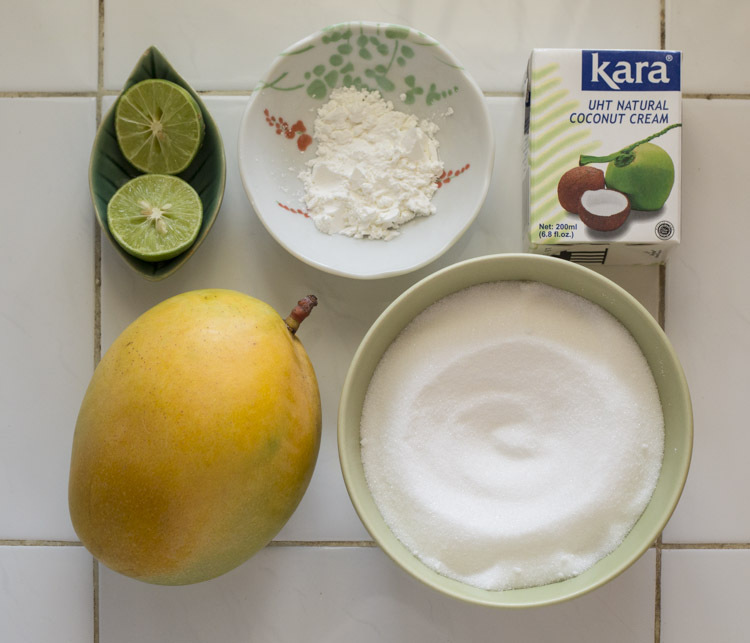 Pour the pulp into a saucepan and add the remaining coconut cream, sugar and salt, then squeeze in the lime juice. Stir to incorporate and taste – you can see from the black spots in the picture above that my mango was super-ripe, so you may need to add more sugar if your mango wasn’t quite as sweet. Heat the pan over a medium flame until the first bubbles appear, then turn down the heat and scrape the cornflour/arrowroot slurry into the saucepan and stir. 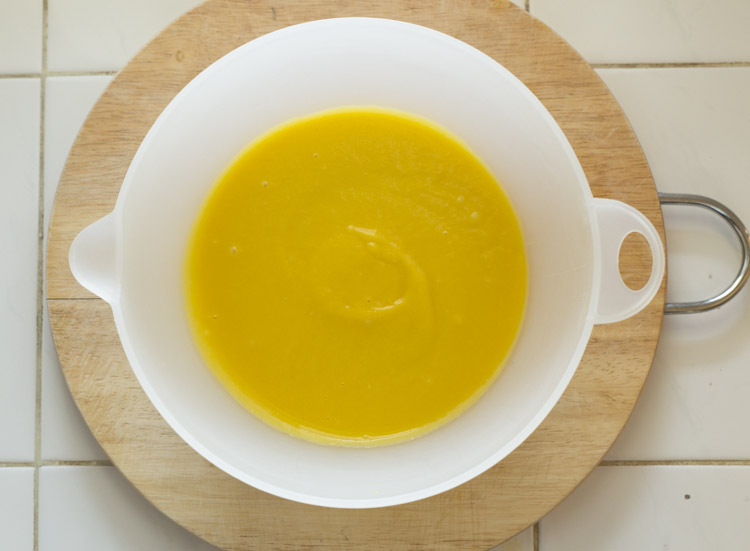 Continue to heat gently for about 5 minutes, or until the mixture looks like bright yellow custard. 3. I don’t have an ice cream maker, so at this point I simply bunged the mango mix into the freezer and stirred it every 30-40 minutes, scraping down any icy bits until the mix had frozen properly. This process took about four hours, at which point I stopped caring checking. After a few more hours in the freezer, the final ice cream was creamy, mangoey and pleasingly scoopable. 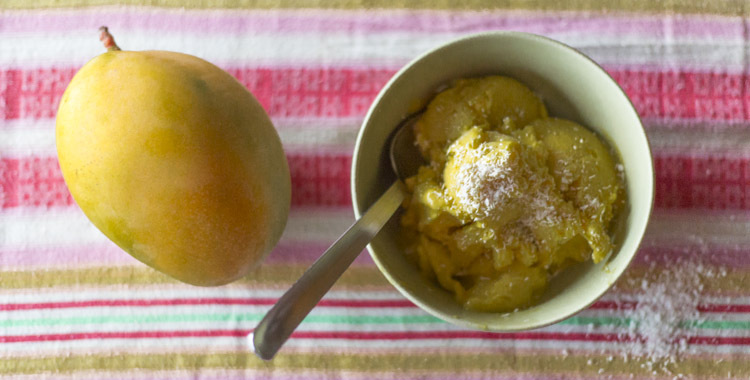 Ripe mangoes are much easier to scoop out, so this ice cream is a good way to use up over-ripe fruit. Wow – since mango with sticky rice is my favorite Thai dessert and I love ice cream, this is a must!